Joy in the Journey: It's Time to Get EXTREME! 21 Day Fix EXTREME, that is. It's Time to Get EXTREME! 21 Day Fix EXTREME, that is. Today's the day! After several months of waiting, 21 Day Fix EXTREME has been launched! And my copy is on its way to my eagerly awaiting little hands! Not that I'm excited about it or anything...not at all. Now, before you ask, even though EXTREME is headed my way ASAP, I have absolutely no plans to abandon my new-found love for Combat and Pump. I'm having way to much fun to switch horses midstream, so to speak! BUT, all that to say, I do plan on incorporating the eating plan. After all, that was the main driving force in the Fix, right? Ok, so, you know how much I love the Fix. All you have to do is spend a little bit of time here on the blog, and you'll see just how life-changing I believe that program to be. Just check out my original results, or the story that is still my absolute favorite, ever. So, yes, it's pretty apparent that I would be jumping on the bandwagon for the Fix Extreme. But what if you're not sure? What if you need a little bit more information? If that's the case, then you have definitely come to the right place! I have the "inside scoop," so to speak! Let's get started, shall we? First of all, let me stress that Fix EXTREME is NOT for beginners!! It's intense; it's challenging; and it will be just as much mental as it will be physical. Remember the sneak peek I had back in January? Crazy, and crazy tough. You need AT LEAST some sort of fitness foundation. Good news? If you've completed a few rounds of the Fix, you're good to go. If you've completed any of our other Beachbody programs, there's a good chance you're good as well. Even better news? If you give this program all you've got, you will get shredded and will finally lose those elusive "last 10 pounds." Secondly, sticking with the workouts, they're still 30 minutes (YES! ), and there is still a modifier. However, following the modifier will still require that good fitness base. The final point about the workouts is the one that kind of scares me a teensy bit. She is going full-on plyo, and plyo with weights. Autumn is channeling her inner Shaun T, I think! Now, nutrition: you get choices! The choice between two meal plans, that is. The first is going to be a tightened up version of the original Fix - no cheats, no treats, and no WINE! :( It will still have elements of the original Fix but will be stricter. The second meal plan will be exactly what Autumn eats when she's preparing for a fitness competition. As in, what she actually eats three weeks out. Did I mention EXTREME was going to be mentally challenging? So what do you say? Are you up for the challenge? 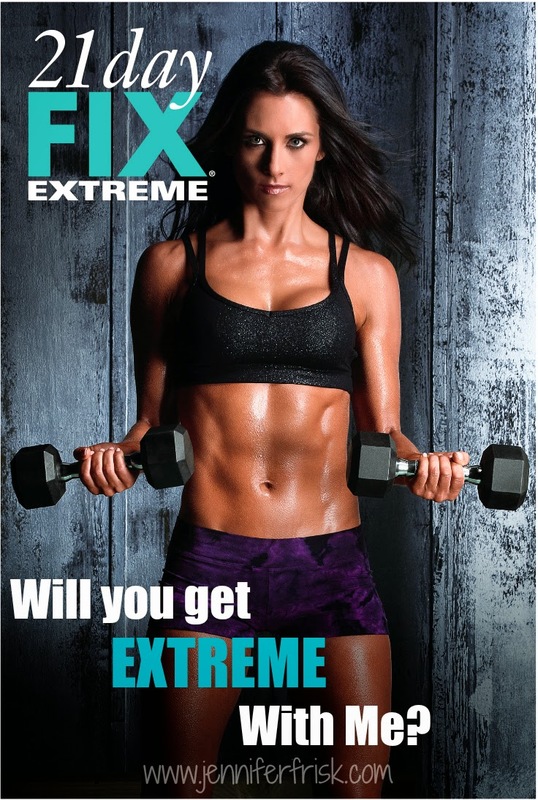 Are you ready to get EXTREME? Send me a note and we'll chat! I can't wait to hear from you!